The sixth HMS Norfolk, a Type 23 frigate, was laid down in 1985 by Yarrow Shipbuilders. She was launched on the Clyde by Princess Margaret, Countess of Snowdon in July 1987 and named for the Dukedom of Norfolk. She was commissioned on 1 June 1990. 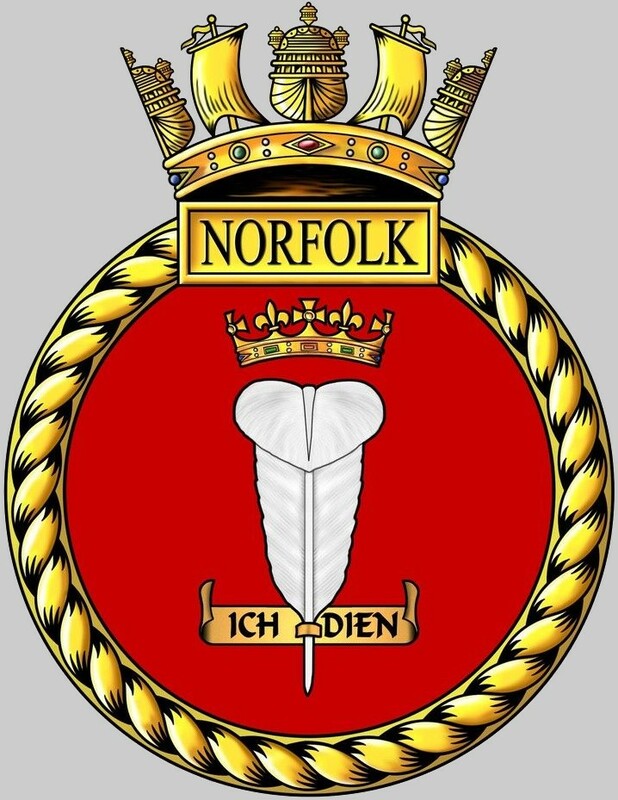 Norfolk was the 'first of class', as well as being the first of a new generation of 'lean manned' ships. She was commissioned into the Chilean Navy in 2006 as Almirante Cochrane. 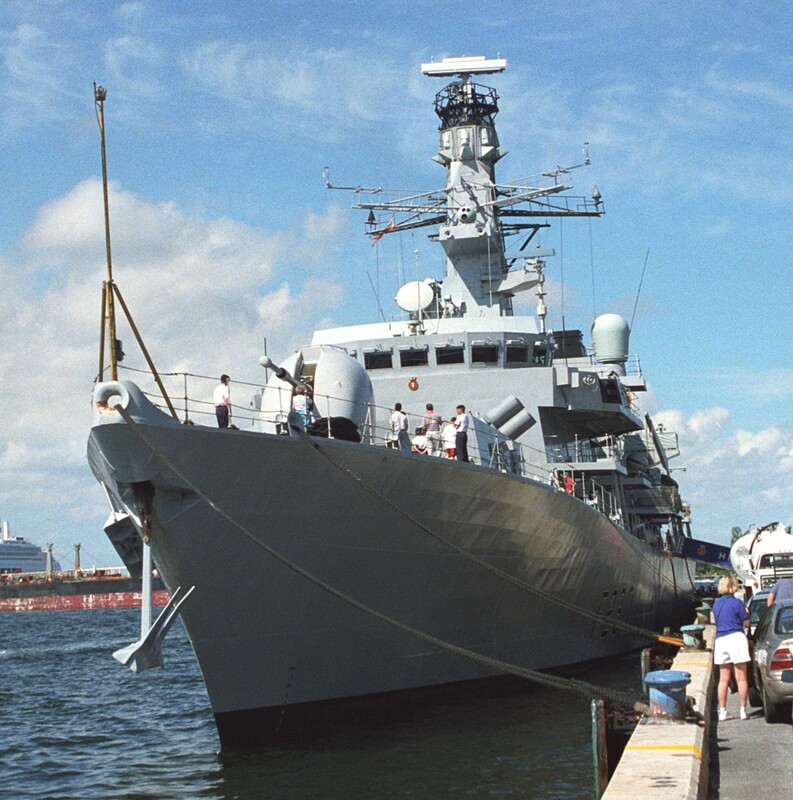 In 1994, Norfolk became the first Royal Navy warship to visit South Africa in over 20 years, a visit designed to show that the commonwealth was ready to accept South Africa as an ally resulting from the abolition of apartheid. Since then, she has conducted many operations, including a deployment to Sierra Leone in 2000 as part of a Royal Navy task force to assist in restoration of peace and stability to the war-torn West African nation. 2000 was a busy year for Norfolk with a deployment under Commander Bruce Williams to the United States. Amongst the places visited were Savannah, Wilmington, Port Canaveral and Nassau. She has also served in the Mediterranean Sea and the Persian Gulf, as well as being involved in Standing Naval Force Atlantic. Other duties included acting as guardship for the Falkland Islands, as well as the Caribbean. A chance encounter in 2000 attracted a local bottlenose dolphin whilst on exercises. A photograph of the encounter was taken and the dolphin, frequently seen in the area, was named Norfolk in honour of this encounter. 2002 saw a busy year for Norfolk, commanded by Commander Richard Talbot. She was deployed with vessels from Portugal, Norway, Spain, Germany, Italy and the United States of America as part of her role within the Standing Naval Force Atlantic (SNFL). As part of SNFL she was involved in a simulated volcanic eruption disaster relief exercise. March saw Exercise 'Strong Resolve' off Northern Norway, then in April she was in the Mediterranean as part of Operation Direct Endeavour for NATO. During the Mediterranean deployment there was a visit to Malta, including hosting the Princess Royal, for the celebration of the anniversary of the award of the Grorge Cross to the island. The 30,000-nautical-mile (56,000ÿkm) voyage was also the last for Mr Chick MBE, a laundryman who served for 50 years including the Yangtze Incident, Korea and Suez through to the Falklands Campaign and Gulf War. Norfolk then attended the 2002 Navy days at Devonport. 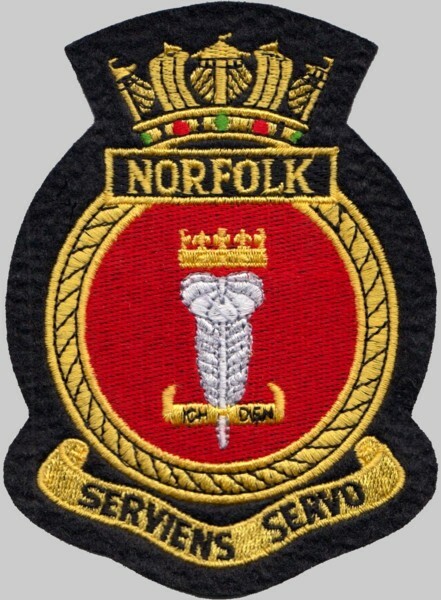 2002/3 saw the crew of Norfolk deployed with 'Green Goddess' fire engines to compensate for the fire service strike. Norfolk spent 169 days alongside the wall at HMNB Portsmouth. May 2003 saw Norfolk sail to her home base of Devonport and resume her active role, training ready for her deployment to the Gulf on Op Telic 1/2. Amongst the simulations were attack runs by small attack craft, similar to the one which attacked USSÿCole. Norfolk was the first ship to be armed with the Vertical Launch Seawolf missile system. Norfolk was also the first Royal Navy warship to be re-armed with the new 4.5ÿinch (114ÿmm) Mod 1 gun system. 2004 saw Norfolk involved in the celebrations of the centenary of the Entente Cordiale with France. Norfolk also took part in the 2004 amphibious warfare-themed Devonport Navy days. 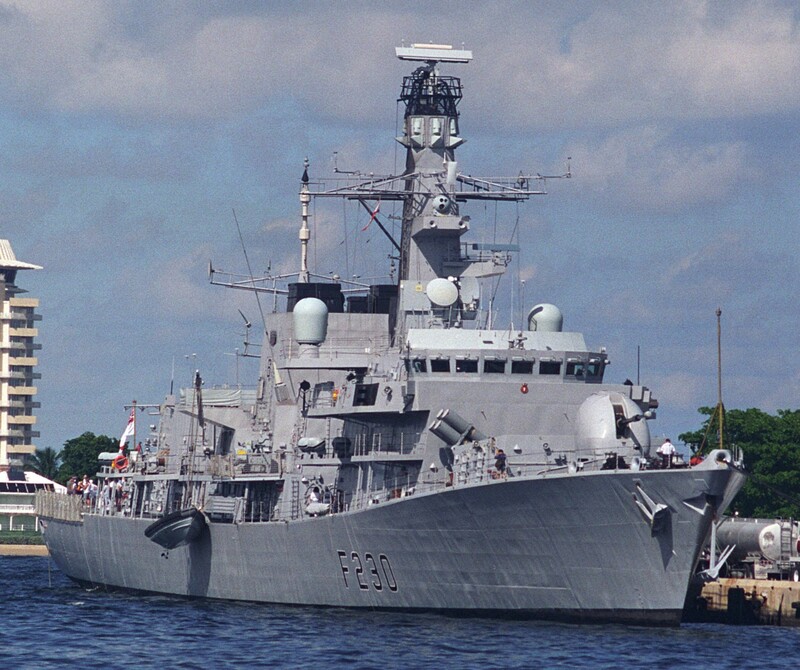 In July 2004, it was announced that Norfolk would be one of three Type 23 frigates decommissioned by the end of 2007. Norfolk entered her home port for the last time at then end of November 2004 was decommissioned at Devonport on 15 April 2005, the guest of honour being then Commander-in-Chief Fleet, Admiral Sir Jonathon Band, who had been Norfolk's first commanding officer. In June 2005 it was announced that Norfolk would be sold to the Chilean Navy. She was commissioned into the Chilean Navy on 22 November 2006 as Almirante Cochrane (named after Thomas Cochrane, 10th Earl of Dundonald). The Duke of Norfolk is the premier duke in the peerage of England, and also, as Earl of Arundel, the premier earl. The Duke of Norfolk is, moreover, the Earl Marshal and hereditary Marshal of England. The seat of the Duke of Norfolk is Arundel Castle in Sussex, although the title refers to the county of Norfolk. The current Duke of Norfolk is Edward Fitzalan-Howard, 18th Duke of Norfolk. The dukes have historically been Catholic, a state of affairs known as recusancy in England. All past and present dukes have been descended from Edward I; see Dukes of Norfolk family tree. The son of Thomas Howard, 3rd Duke of Norfolk, was Henry Howard, Earl of Surrey; the Earl was descended from both King Edward I and King Edward III.